The West Vancouver Museum‘s 13th Annual West Coast Modern Home Tour features a selection of five unique mid-century and contemporary homes that exhibit the best of West Coast modern design. This year’s exclusive home tour takes place on July 14 from 12 to 4 p.m., followed by a reception at Eagle Harbour Yacht Club from 4 to 6 p.m. A complete information package with details of the tour homes and a self-guided map will be available to participants at check-in. The five tour homes will be announced in June. Check-in at the Atrium at the West Vancouver Municipal Hall from 10:30–11:45 a.m. Reception: Eagle Harbour Yacht Club: 4–6 p.m. Explore spectacular mid-century and contemporary West Coast modern homes perched on the rocky slopes of West Vancouver! The West Vancouver Museum’s 13th Annual West Coast Modern Home Tour presented by British Pacific Properties features a selection of five unique mid-century and contemporary homes that exhibit the best of West Coast modern design. This year’s exclusive home tour takes place on July 14 from 12 to 4 p.m., followed by a reception at Eagle Harbour Yacht Club from 4 to 6 p.m.
A complete information package with details of the tour homes and a self-guided map will be available to participants at check-in. The five homes selected for the tour include architectural features that define the best of West Coast Modernism. The Hemingway Residence is perched on top of a steep granite cliff with a clear view of the Pacific Ocean and surrounded by vegetation. This residence is a remarkable example of the vertical arrangement of interior spaces that was a key element used by several West Coast modernist architects in Vancouver from the late 1960s to 1970s. The home’s architect, Brian Hemingway, has likened the residence to a chapel, a cathedral and a temple—a space that is considered sacred—in which one’s passion for life grows and finds nourishment. From 2014 – 2017, the home was renovated by Fook Weng Chan/FWC Architecture & Urban Design Inc., and builder Sean Michel/SMC Contracting Ltd., achieving a refreshed expression of modern design while staying true to its original concept. An iconic example of West Coast modern design, the Smith Residence was designed by Arthur Erickson and Geoffrey Massey as a home and studio for Gordon Smith, one of Canada’s most influential painters. 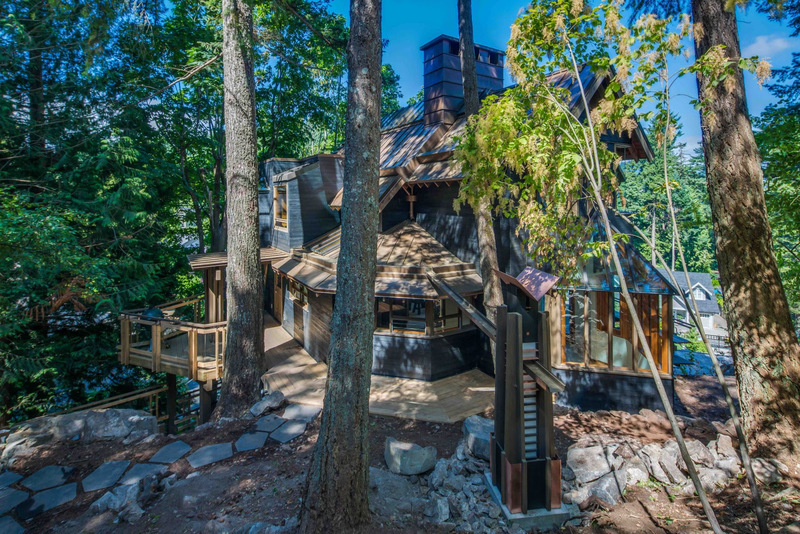 Situated in the forest with views to the ocean, the home is recognized by the Royal Architectural Institute of Canada for its enduring excellence and national significance. Architect Russell Hollingsworth worked on the Smith Residence to both maintain and renovate it, doing so seamlessly and keeping with Erickson’s original design. Originally designed by architect Bob Lewis in 1959, this 50-year-old post-and-beam gem was revitalized after peeling back decades of paint and drywall to expose its original materials. With the help of local design firm, Design Particles, owner Negar Ghorashi approached the renovations of the underappreciated Isleview Residence with the intent to maintain and enhance its natural beauty. The sleek, understated charm of the Ritchie Residence draws inspiration directly from the surrounding natural landscape, a seamless integration of land and building that is marvellous to behold in its simplicity. Four large steps, an expression of West Coast Modern sensibility, lead to the single-story home on the sloping property. Its design is centred on a strong need for light and connection to all the available outdoor space. The result culminates in a home where every room has access to plenty of natural light, terraces, and calming garden views. The Red Residence rests on a steep, sloping mountainside near Dundarave and is a two-storey West Coast Modern marvel designed by McLeod Bovell. Natural lighting, views and spatial sequences take center stage and epitomize new design values and sensory delight heralded in by West Coast Modernism. Expansive, floor-to-ceiling windows allow for a panoramic view of the ocean, reaching as far as Indian Arm and Mount Baker. Registration is limited, so get your tickets now and prepare to meet your fellow tour enthusiasts this summer! To register, please choose one of the following three options and register online or by phone at 604-925-7270. The ticket prices include GST. Please note that some of the houses are very difficult to access. Participants must be able and comfortable walking up and down long, steep driveways and stairways unaided. For updates on the home tour, photos of featured homes and information on exhibitions, please follow the West Vancouver Museum on Facebook. The 13th Annual West Coast Modern Home Tour is presented by British Pacific Properties.